Whew! We made it through another week! We deserve a little something special to celebrate, don't we? How about some extra time stamping this weekend? The Design Team at Fab Friday has a fun sketch to help you get the weekend started off right! I will admit that I struggled a bit with this sketch. I just couldn't get those skinny elements to look right going over the top of the large panel. I decided to stop fighting it and just interpret the sketch a little different. Remember it's just a starting point so don't be afraid to tweak your design a bit. You can still see the essential parts of the sketch though right? And I did flip it because, why not? I'm all sorts of a rebel this time! I wanted to start working on my Father's Day cards since sometimes guy cards can be really hard and under pressure can make it even worse! The card base is Whisper White thick and I built up the rest of my card on top of a Pool Party panel. The different sentiments are stamped in Pacific Point, Emerald Envy, and white embossing. I used several different stamp sets to achieve this look; "You Rock!" and "The Best" (and the heart and star) are made with the Labeler Alphabet, "Fabulous" and "Amazing" are from Thoughtful Banners, "One in a Million", "Rad Dad" and "Love You" are part of the Custom Tee set and "Wonderful" is found in the Sunshine Sayings set. The tee is stamped in Pacific Point with accents in Emerald Envy. I hand cut it out and popped it up with dimensionals over a strip of Pacific Point and an embossed piece of Emerald Envy. I added a few Pacific Point enamel shapes to balance that side of the card. I hope it's close enough to the sketch! 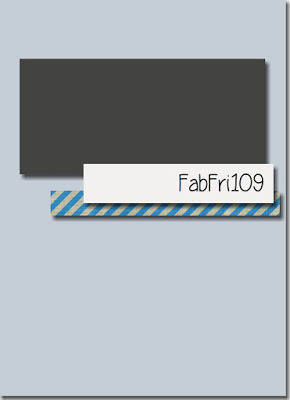 Please check out the rest of the Fab Friday Design Team samples and then play along with us! I'd love to see your creation in the gallery! Sometimes I'm surprised by which stamp sets catch my eye initially and which ones I end up using the most. Avant Garden was a pretty flower set that I liked but didn't think I would be using it half as much as I have during this year's Sale-a-Bration. You can't get more simple than this card! It starts with an Old Olive base stamped with the little leaf/branch stamp in Old Olive ink. Then I dug through my stash of retired Newsprint DSP as a layer behind the flower. The flower is stamped in black onto Very Vanilla cardstock. I used the Watercolor pencils to color in the flower and stem. A blender pen blended the colors nicely. Old Olive, Rich Razzleberry and Daffodil Delight were the colors I used. I used a bit of the vanilla/gold ribbon and added just a bit of sparkle to the blossoms with some Wink of Stella. I left off a sentiment on the front and can add whatever sentiment I need on the inside before mailing. It's great to have a few all occasion cards in your stash because as much as we would like to design a card for every occasion sometimes there just isn't time! Sometimes it's hard to come up with an interesting card design for a guy. We're stuck between wanting to add lots of layers and fun embellishments and trying to keep the card from getting too girly. It's a tough place for card makers! Guys deserve beautiful, creative and fun birthday cards too. At my last stamp club I had my stampers make this masculine birthday card. The colors definitely point to a guy card and there is a little unexpected fun on the inside. The card base is Cajun Craze. I paired the Cajun Craze up with a strip of Basic Gray and then the stamping is done on a large panel of Whisper White. The balloon strings are stamped with Smoky Slate ink. Once the balloons and strings were stamped the large sentiment was stamped in Basic Gray. The open letters are colored in with a Pumpkin Pie marker. I had the other card color markers out to so everyone could choose which color they wanted to use. Now for the fun part on the inside! Excuse the photo...this was a hard one to get a good angle of. It's a fun little pop up feature when you open the card! The inside Whisper White panel measures 7 1/2" by 4 3/4". It's folded in half and then 3 quick measurements of 2 1/2" -- from the center fold to left 2 1/2" (make a light mark with a pencil), from the center fold to the right (make a light mark with a pencil), from the top of the center fold down 2 1/2" (make a light mark with a pencil). Using your scoring tool of choice (we used the envelope punch board--it has nice diagonal scoring groove perfect for this project) line up your top pencil mark with the pencil mark in the center fold and score just until you reach the center score line. Then repeat with the other top pencil mark. Gently fold along the diagonal score lines to make your pop up. Adhere the scored panel to the inside of your card making sure to leave your adhesive off of the triangle shaped pop up areas. To decorate the pop up we stamped and punched a few balloons, added strings and then popped them up with dimensionals. See it's pretty easy to make a good guy card! I'm digging deep in the vault today to share a card I mailed out to my stampers to invite them to my Sale-a-Bration open house at the beginning of January. The Custom Tee stamp set in the Occasions catalog is so cute and I've loved stamping with it. The card base is Soft Sky and is stamped with the 2 small flower stamps from the set in Soft Sky ink. This card was my original design and I for the 40 I made to send out to my stampers I skipped coloring in the center of the flowers to save a bit of time. The DSP strip is a piece of the By the Shore paper. I love the colors in this paper, very fresh. Next is a little flag of Dapper Denim ruched ribbon. And the final piece is the t-shirt embossed in white on Calypso Coral cardstock and then cut out with the coordinating framelit. All in all a pretty simple design. Enjoy life and have fun. Sometimes that's easier said than done, isn't it? But it's nice to have a reminder and Stampin' Up! has a great stamp with fun fonts for us to use to keep this sentiment in mind. This is a very basic card using Calypso Coral as the card base. A panel of Whisper White with the corners rounded is stamped with both the large and small blossoms from the Special Reason stamp set. I started with the darkest color on top, Calypso Coral and then worked my way down the card with Peekaboo Peach next and then So Saffron. The small So Saffron blossoms are stamped off once for just a little bit lighter look. The great sentiment Enjoy Life and Have Fun is inked up in Versamark and stamped right over the top of the flowers and then embossed with black embossing powder. I didn't add any other embellishments and just let the bright colors pop against the black sentiment. Fab Friday is back with another great challenge to get your creative mojo going! I missed playing along last time around but I'm glad to be back with this fun color challenge! My mind went straight to flowers when I saw this group of colors so I pulled out my Avant Garden Sale-a-Bration set and got busy stamping some spring flowers. The card base is Mint Macaron and then I stamped the flowers in each of the other colors first stamping off once, then using the single petal? leaf? stamp to highlight the center of each flower with the full strength ink. Using Mint Macaron ink I stamped the stamen. The Stitched Shapes framelits made quick work out of the cutting. I layered the flowers over the top of a Whisper White panel with the bottom corners rounded. The panel has the sentiment stamped in Basic Black. I wrapped a few lengths of linen thread around the sentiment panel and tied a bow. A tiny sprinkling of adhesive pearls finishes this card up. I need a few more thank you notes so I think I'll be making a few more of this design while I have all the supplies still out! The team over at Fab Friday hopes you'll check out all the inspiration and share your card with us in the gallery. Remember you have 2 weeks to ponder, stamp and share! Sometimes it is fun to make detailed, layered cards with lots of elements and sometimes it's nice to stay really basic and let the images stand on their own without a lot of extras. I went really CAS with this card and used it as a design stepping stone to a card my stampers made at our last class. I'll share that one another day so don't worry there is another butterfly card in your future! I got my inspiration from a home decorating catalog that had a room set up that had a pair of butterfly prints hanging on the wall. The butterflies were in gray and gold and I thought that would be a cool look to try to recreate on a card. Watercolor Wings was the perfect stamp set to work with for this idea. The card base is Whisper White thick, then another layer of Whisper White with the corners rounded. The butterfly is stamped in stages with the base being Smoky Slate ink stamped off once, then the edges stamped in Smoky Slate full strength. The center detail is stamped in gold ink stamped off once. The body is Smoky Slate and antennae are gold. And that's it....just layering 2 different colors of ink in varying intensities. The sentiment from Sheltering Tree is embossed in gold embossing powder onto a strip of vellum. I used a longer strip so I would have extra on the sides to wrap around the back of the butterfly layer and adhere. That way I don't have to try to hide any adhesive on the front. I added a bit of gold cord as the only embellishment. It's a cold rainy/icy day here in Richmond. I woke up to the trees covered in ice and the wind blowing. Today is definitely a day to stay home and stamp if you can! Unfortunately, I've got errands but maybe I can find some time in my warm dry stamp room later today! I haven't used the Fox builder punch to make many foxes oddly enough so I thought it was time to make one and design a birthday card around it. Now that I'm looking at this card it seems that it's a bit tilted! Oh well! That's just one of the ways to tell it was handmade right? The card base is Whisper White thick with the 2 corners rounded. A piece of Soft Sky was embossed with the Softly Falling embossing folder. I used the Tree Builder punch to punch out a fluffly white cloud and popped it up with a dimensional. The fox was punched with the body using Cajun Craze and the accents in Whisper White and Basic Black. He is also popped with dimensionals. The Old Olive banner is stamped with the small Happy Birthday sentiment from Balloon Adventures from the Occasions catalog. I added a little Basic Black bakers twine bow to one end. Not much stamping on this one! The punches do the heavy lifting this time around. Just a quick post today...I was lazy all weekend with the excuse that it was my birthday so now come Monday I have quite a bit to catch up on. When will I ever learn lol?! I never like to make sympathy cards but if there is ever a type of card that needs to be sent this is it. For this card I wanted a soft look but with a bit of color. The card base is Whisper White thick, then a layer of Sahara Sand with the "praying for you" sentiment from Thoughts & Prayers embossed in white. The image panel is the swirls from Swirly Bird also embossed in white. Then I used my watercolor pencils and a blender pen to color inside of the swirls. I used Daffodil Delight, Calypso Coral, Melon Mambo and Rich Razzleberry. The large flower? (swirl?) is stamped first in Rich Razzleberry and then the swirl part is embossed in white and then cut out. I popped it up with a dimensional and tucked a bit of retired Whisper White seam binding ribbon behind it. To ruche it like this just hold a few of the threads at one end and slide the rest of the ribbon until it bunches up to to your liking. Here's a quick little tutorial I did a few years back on this easy technique. With Stampin' Up! coming out with new seasonal catalogs several times a year sometimes I find myself forgetting to use favorite stamp sets from the annual catalog in favor of the newest stamps in my collection. I made an effort to pull out a stamp set that hadn't seen much ink lately; Celebrate Today. I paired up the Celebrate Today sentiment stamp with the Balloon framelits. Instead of using the balloon stamp I wanted a bit more of a translucent look so I used the balloon framelit to make a stencil and then sponged my ink onto Whisper White cardstock overlapping the edge just a little bit. I used my Basic Black marker and a ruler to draw the strings. The "celebrate" banner is stamped in Versamark and then embossed with white embossing powder. I popped it up on dimensionals, added a Pumpkin Pie knot and some Tempting Turquoise enamel shapes. I'm still trying to get through sharing my backlog of cards from the past 6 weeks! Today's project is another one that we made at my January class. With wedding season fast approaching it's always nice to have a bridal shower or wedding card on hand. We go to far fewer weddings these days but this kind of celebration card is always fun make. Using the Custom Tee stamp set and coordinating T-shirt Builder framelits we made this fun bride and groom card. The card starts with a thick Whisper White base. Then a wide panel of Soft Sky is embossed with the Festive embossing folder. Next comes the happy couple. The tux outfit is just the shirt and bowtie diecuts used with Basic Black cardstock. The shirt and collar are stamped in black onto Whisper White and cut out. The dress is made first by cutting out the ladies tee in Whisper White. Then using 1 Delicate White Doily the layers of the dress are trimmed and adhered with each layer being just a bit wider ending with 4 layers. A tiny piece of 1/8" Whisper White grosgrain ribbon defines the waist. The 3 flowers are stamped in Watermelon Wonder onto Watermelon Wonder cardstock. You can use the matching flower die or just hand cut them. Mini adhesive pearls are added to the center of each flower. This is a very easy card to customize to the wedding or shower colors. It would even work well as a shower invitation if you're in need of those! I am getting more use out of the Special Reason stamp set than I thought I would when I first bought it during our demonstrator preorder back in December. Adding the coordinating Stylish Stems framelits gives even more ways to design cute cards. My stampers made this card at the January class. I paired up some brighter colors with the trendy gray Smoky Slate for a fresh spring like card. The card base is Smoky Slate and then a layer of Whisper White with the corners rounded. Using the large detailed flower die we cut it out slightly off center to leave room for layering the other flowers. The large flower is stamped in Peekaboo Peach and the small flower in Melon Mambo and both are cut out. Before adhering the large flower there is a flagged piece of A Little Foxy DSP with a bit of organza ribbon layered on top behind it. I cut out a bunch of the Smoky Slate patterns from this paper stack for my stampers to choose from...there are lots of choices in this small stack of paper. The flagged end is curled just a bit with a bone folder. The Melon Mambo flower is adhered with a dimensional and the sentiment is stamped in Smoky Slate for the last touches. So did you all think I had fallen off the face of the earth? I just have been really busy and blogging is the thing that, unfortunately, I can let fall by the wayside from time to time. I do have lots of projects to share though and I hope to get back to a regular blogging schedule. We only have a few more weeks of Sale-a-Bration left so I better get to sharing some of the projects using them before it's too late. My stampers made this card at the end our January stamp club (see how far behind I am??). It can be a great birthday or a Valentine's day card (a month ago!). The card base is Crumb Cake, then a layer of Basic Black, then a layer of Real Red stamped with the Hardwood background stamp using Crumb Cake ink. I used Crumb Cake ink because it was a bit lighter and more subtle than using the Real Red ink and I didn't want the sentiment to get lost. The sentiment is from Sealed with Love stamp set in the Occasions catalog and is stamped in black. The sweet little hen is stamped in Stazon onto a strip of watercolor paper. She is colored in with the watercolor pencils and a blender pen. A black baker's twine bow on top of the watercolor paper panel finishes off this card. I sent this design out to a few people for Valentine's day and I made sure to send it to my cousin who has chickens and a bit of a chicken lady and she loved it! We went to Southern States the other day to get some bird seed and they have their baby chicks out and they were so cute just peeping away. Spring is on it's way!